Francesco Rosi's l979 adaptation of Carlo Levi’s Christ Stopped at Eboli, currently in revival at Film Forum, takes place during the fascist era. Levi was a painter and writer. Originally trained as a doctor, he was exiled to the harsh isolated Basilicata area (called Lucania in the Mussolini period), in what is known as the "instep" of the south, as a punishment for his political beliefs. 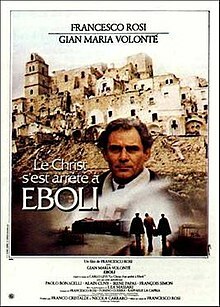 The title can be confusing since it sounds like Christ made a stop at Eboli when actually the meaning is that the spirit of Christ stops at the Eboli train station where Levi (Gian Maria Volonte) ends the first leg of his journey. Matera famous for its caves is the county seat and it’s interesting since that’s precisely where Pasolini filmed The Gospel According to Matthew, in which Christ is depicted as a proto Communist. There are 10 other prisoners who are not allowed to speak to each other, a fascist mayor Don Luigi (Paolo Bonacelli) who exhibits a grudging respect for Levi’s intellect and an alcoholic priest who describes the people of the town as being even “worse than the land.” The village in which the movie takes place is literally carved into a rock. The movie partakes of what might be termed romantic naturalism. Levi was a proponent of peasant culture in which he immersed himself. When moved by conscience and necessity, he employed his medical training to help the suffering peasants.The movie is an extended argument about the tyranny of Italy’s petty bourgeoisie over peasants and factory workers—ending in a protracted and somewhat overblown Socratic dialogue on the subject after Levi is freed and returns to his upper middle class life in Turin. Christ Stopped at Eboli is also epic and bears some degree of comparison not in content but weight to the large scale overview of Italian society and history Visconti created in his masterpiece about the Risorgimento, The Leopard. It’s hefty, panoramic, multilayered and filled with emblematic moments including a call to arms masked as a Christmas benediction and a harshly lurid scene presided over by a pig castrator that’s a cinematic poem.